I am so excited to tell you about Maria Shell's beautiful and inspiring new book, Improv Patchwork: Dynamic Quilts Made with Line and Shape. 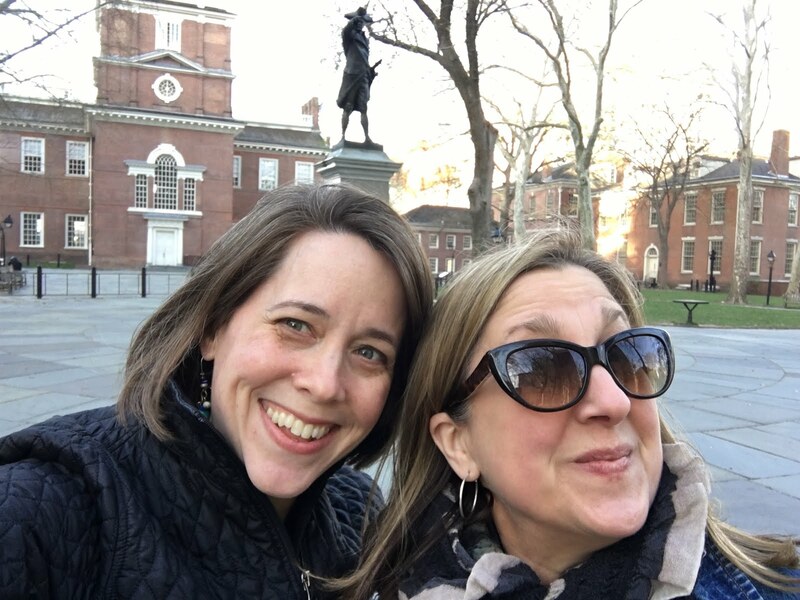 Here are me and Maria at the SAQA Conference in Philadelphia when we took a walk to go see Independence Hall and the Liberty Bell. And here is Maria's amazing new book! I love Maria's work! Patchwork is a traditional technique... but Maria's quilts are something special. She pushes every color, shape, seam and fabric combination to do something NEW. So, let me share my top 10 reasons why I love this book! 1. Such stunning images. 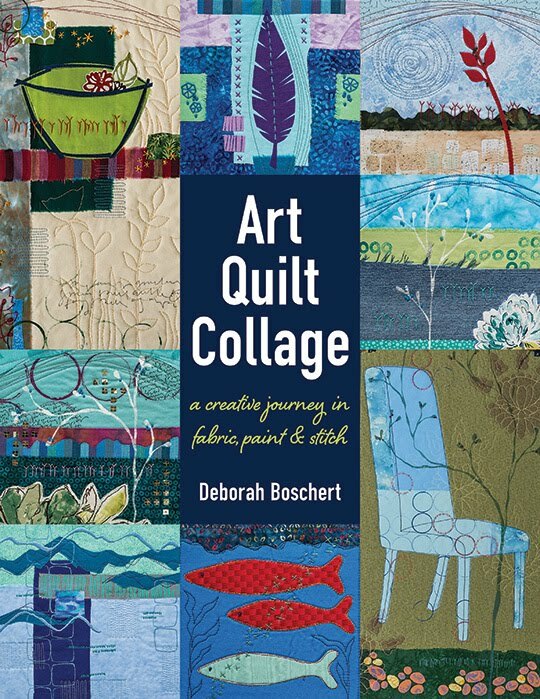 Maria created several new quilts for this book so I was super excited to see some quilts I'd never seen before. 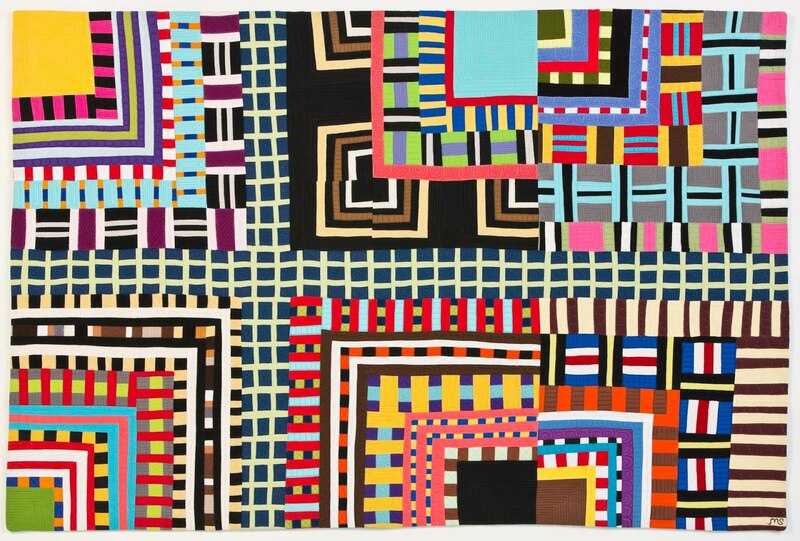 Even though I don't generally make pieced quilts, I am really inspired by her color choices and the variety of scale in her work. 2. The book is a genius combination of methods for making various parts (like stripes, chevrons, and polka dots) AND ideas for putting the parts together. 3. It's full of specific suggestions for how to truly pay attention to detail so you get the best results. 4. Tips! There are several sidebar sections about being fearless. She should make poster-sized versions of these tips so we can all post them in our studios (especially the one about being fearless with color). 5. Controlled wonkiness. Yes, it's possible. 6. We both like chairs. 7. Maria and I both graduated from the University of Kansas William Allen White School of Journalism. That means the book is an example of what you can create when you are thoughtful and hard-working... because that's how we do it Kansas. 8. Nitty gritty details about what you need in a sewing machine, the best tools and use of space. 9. Ideas about creating a Personal Color Identity. Great stuff -- and it applies to any kind of artist! 10. You can win a copy of this book right here. Leave a comment here sharing what interests you most about Maria’s work. I will randomly select one lucky winner when the hop is over. That means you have until midnight Alaska time on October 26 to leave a comment. If you live in the states, C&T Publishing will send you a hard copy. If you are international, they will send you an electronic version of the book. A winner has been picked! But you should still buy the book! If you must have the book now now now you can order it from C&T Publishing or Amazon. Be sure to visit the other blogs on the blog hop for more info about Maria's book and more chances to win a copy. Wonky, wild colours - what's not to like? I'd love to win this book!!!! I love how she plays mixing the colors,more with solids. I would love to read more about creating a Personal Color Identity. She has a great hand with color! I really want to see the "genius combination of methods for making various parts AND ideas for putting the parts together." that is what interests me the most. 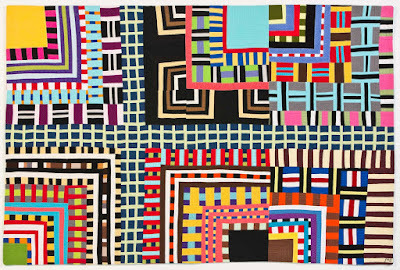 Such variety and energy is seen in her quilts, I want to read how she works and makes these treasures. Love Maria's work, yours also! Would love to win the book. I like the way she used different sizes in making the chevron patterns. "Controlled Wonkiness" is what interests me most as I adore the improv technique! I love that I don't have to follow the traditional rules or worry about perfection to create something totally unique and beautiful. Using scraps is a bonus when improv enters my project. I love everything about this book and already find myself inspired by the photos shared. I love the wacky placement of color. I love color and always quilt with my own inspiration. This book would be great for ideas. Thanks. Like you, I love Maria’s color and pattern combinations. Have you seen the backs of her quilts? Equally amazing! I also love Maria herself! Love the vibrant color combinations and how her improv looks like improv but not chaotic. I am suddenly so tired of everything I've been doing and have this urge to just pull out all my solids and piece triangles! I dont know where this came from, but I think I need Maria's book immediately! I love that you both graduated from KU School of Journalism. Go Jayhawks! (sorry, I was born there). I, too, have received a copy of Maria's book. I love it! Maria has clearly been influenced by Nancy Crow, an artist I have studied under and have great respect for. I really appreciate how Maria has taken the influence and made it her own. Her explanation of how she works makes the methods very attainable. The book is beautiful and readable. Well done! I like her use of color but I am most interested in the improv piecing. I would like to explore creating/discovering my personal color identity!! Love the idea of this book. Lots of practical hints are something that I always appreciate. Thanks for the chance to win. I like that she makes it look so do-able. She walks you though step by step, which is helpful to us beginners. I love her vivid use of colour. I am just starting to dabble in improv and this book looks like a great place to start. Love her use of color. I love the way Maria playfully uses color. She lets the colors play off each other, some will pop and others play supporting roles. I also love the linear designs with skinny lines. I haven't purchased many "how to" books recently (except your book, of course), but from everyone who as seen it up close and personal, I hear nothing but rave reviews. Definite addition to the library. Love her colors and shapes used to make a design. Maria's improv manages to have a strong personal style that sets it apart from other improv work,its noticeably hers! I cant wait to read her book! And would love to win it. I love how Maria makes completely new fabric & then starts making her quilt. Very inspiring. I absolutely love Maria's work! She inspires me to piece more, and to dive into my stash of solids and play! 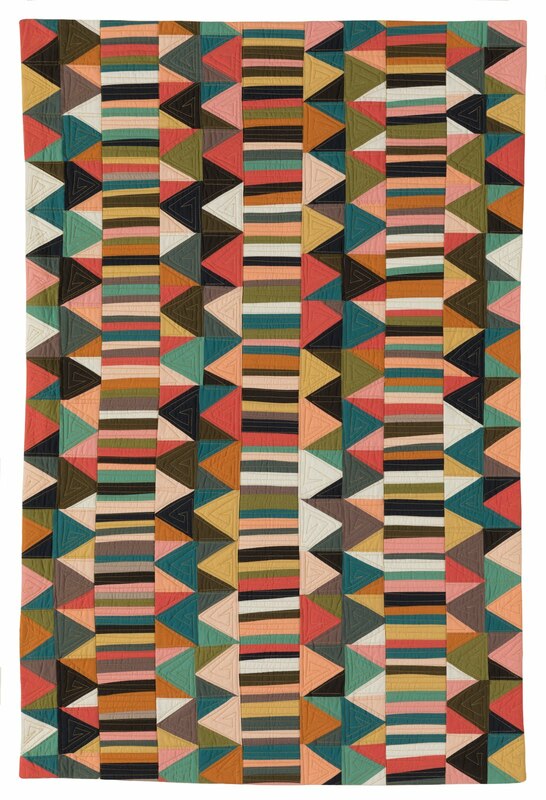 I love these quilts they are a blend of modern and Gee's Bend, may try my hand a this style. I love her use of color and am fascinated by her practice of blowing up a single quilt block and then filling it with incredible detailed piecing. I love everything about Maria's work! I'm especially in love with her teeny, tiny, itsy, bitsy crosses! They make my heart sing! Thank you for the chance to win a copy of her book! I find the complexity of Maria's quilts so intriguing. I'm a long time fan of Maria and her work! I love the way she quilts each space and the way her quilts look on the back. I also love her blog posts which make me think about things in new ways. My copy of her book is scheduled to arrive any day now, but if I win, I'd love to share a copy with a friend! I took a workshop with Maria yesterday in LA! Her quilts are amazing. She is a wonderful teacher and able to explain techniques in a clear manner. Would love to win her book! Thank you! What interests me most is learning a new technique of piecing that doesn't use rulers and you don't know exactly what it will look like until it's put together. Little pieces to create bigger pieces. I love the energy in Maria's quilts. Improv isn't in my comfort zone so when a book can provide direction like the parts you talk about it sounds doable and a fun way to explore. I'm drawn to the colors and shapes used in the examples and think it would be fun to give this style of improv a try. Love the bold colors and combos of strong colors. Would love to win this book and learn from Maria's style! I'm fascinated by the improv technique and want to learn more. Maria's works are very inspiring. Solids, I haven't done much with solids. And I love how she uses so many and does it so well. Maria's use of color is stunning! What interests me most is that Maria's work seems unique and that is always a good thing. Much different than other books already in print. I am most interested in Maria's inventiveness. 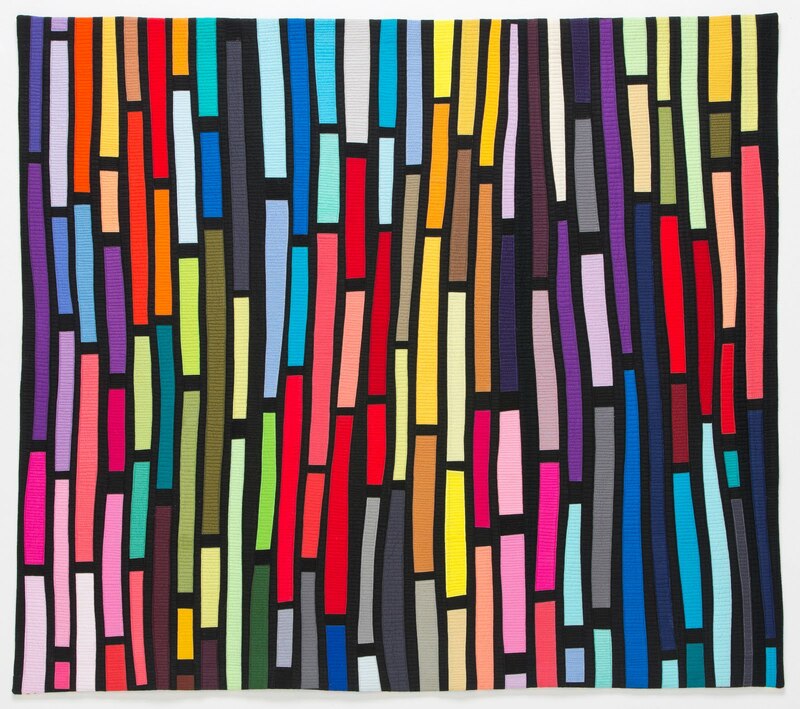 There are lots of improv-technique quilts around the web and in shows, but Maria's rise above the technique and into the realm of art. I am enjoying her use of color! Thanks for a chance to win this book! I love all the the tiny bits made into a colorful whole. I have taken one class with Maria, and I have enjoyed being challenged regarding my color palette. I love the bright and colourful images! So cheerful! 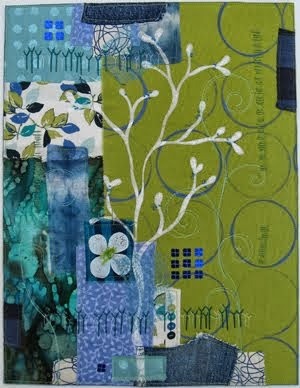 I really like Maria's use of bright colors and the movement in her quilts! Thanks for the chance to win this book-it looks wonderful. I am looking forward to reading the chapter on making prints from solids. I'm a big fan of Maria's blog and her work. Would love her book! I love Maria's fresh look. Yes, the colors, the varying stripes here and there. 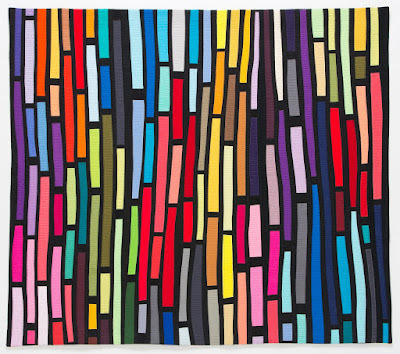 Her work reminds me of the Gees Bend quilts. Each of her pieces would be a great framed piece. 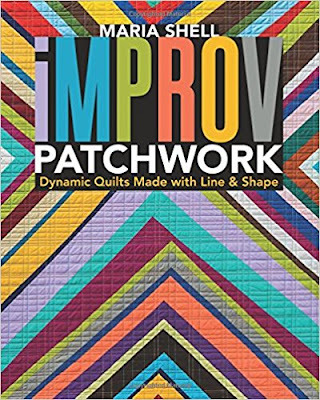 I will eventually get the book of course, because I need help with improv work. However, winning a copy would be oh so fun! Thanks for the opportunity. I love all of her "made" patterns - particularly the use of black. A must have book! I really like how her pieces look fresh andnew instead of the same old shapes we see in some improv work. Her color sesnse is unique as well. I adore wearing gems, but not because they are mine. You can’t possess radiance, you can only admire it.